The TSI AeroTrak 9110 Portable Particle Counter offers an accurate measurement of particles down to 0.100 μm. This is made possible utilizing a patented HeNe laser technology that is low maintenance with an enhanced signal-to-noise ratio. The Model 9110 is ideal for performing ISO-14644-1 classifications for Class 1 and Class 2 cleanrooms. 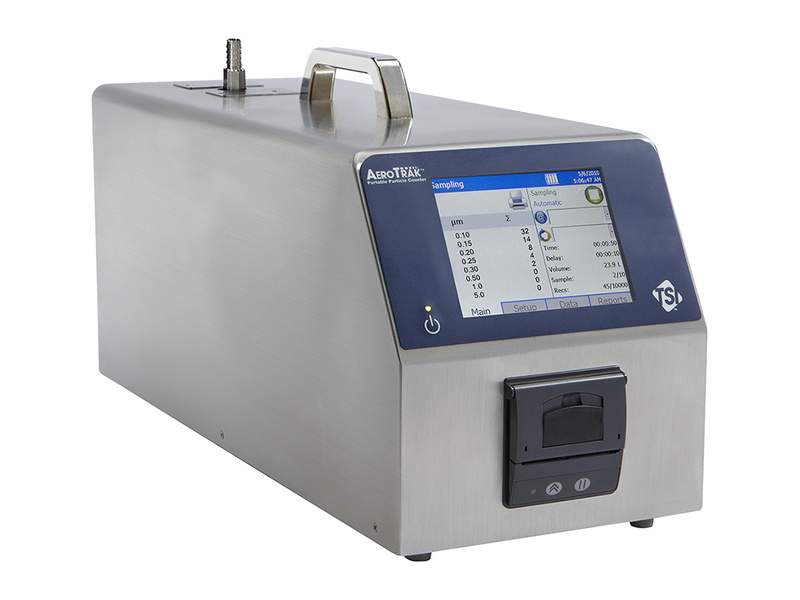 This instrument is designed for cleanroom monitoring, process tool monitoring, and filter test applications. The Model 9110 can generate pass/fail reports for ISO 14644-1 via the onboard printer and the supplied TrakPro Lite Secure download software. The Model 9110 complies with all the stringent requirements set forth in ISO 21501-4. It is calibrated with NIST traceable PSL spheres using TSI’s world-class Classifier and Condensation Particle Counters, the recognized standard for particle measurements. TSI ‘s commitment for superior service and support, there are no other portable 0.100 μm particle counters like it on the market today.